Greetings, readers. I hope you’re enjoying our return to baseball as we gear up for the trade deadline and the stretch run. Cliche as it is, I can’t believe we’re here already. It seems like just yesterday we were talking about shaking out a new lineup and anticipating Aaron Boone’s performance as a manager. The years really do seem to go faster and faster, don’t they? Anyway, here are some thoughts I’ve had about baseball and the Yankees, ranging from the All Star Game to the trade deadline, and a few places in between. The main wish you have for your team’s All-Star participants is for them not to get hurt. Next, it’s for them to play well and have fun. 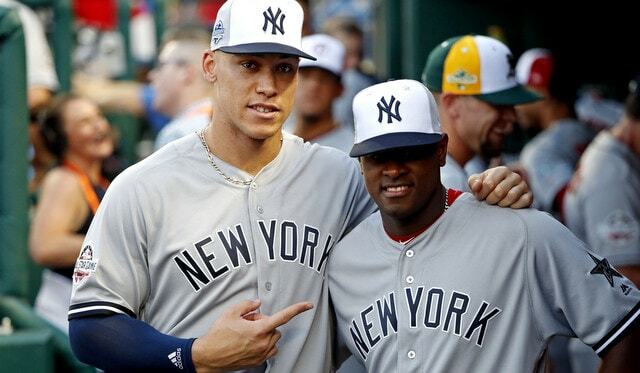 It’s hard to argue with the latter two for the Yankees’ representatives at the ASG. Aaron Judge hit a home run and Luis Severino had a great inning, featuring a nasty strikeout of Bryce Harper. Additionally, Aroldis Chapman snapped a bunch of cool pictures and Gleyber Torres videoed Judge’s homer from the dugout. More stuff like that, please. The ASG is already an exhibition, so just go all out with it. Have bench players video everything. Mic up all the players–pitcher and catcher excluded–and play that audio for an inning. It’s unlikely that MLB switches up to a new format–East v. West; US v. World, etc.–so making the game as engaging as possible is the route to go. Will it attract a bunch of new eyes? Probably not. But it will give current fans a bit of a new look and that’s a welcome thought. Dissing Mike Trout to Own the….???? I’m obviously last in line for this take, but this is what you get when you write on Sundays and stuff happens mid-week. I’ve been up front with my desire for MLB to do a better job of marketing its stars and young players, Mike Trout chief among them. Clearly, Mike Trout is fine with the exposure he already has and with doing things more behind the scenes. That’s great and good for him. Not everyone has to be outgoing. How bad of a look is it, then, for Rob Manfred to shovel the blame onto Trout? How many times is baseball going to keep shooting itself in the foot publicly? Aside from the NFL and its anthem-centric debacles, how could MLB have worse national PR this year? Between the griping about too many homers and walks and strikeouts and constantly digging up the ‘bad’ parts of the game to now calling out the best player in the game, Manfred is on a real streak here. Trout is essentially the epitome of the “play the game the ‘right’ way and keep your head down” culture that MLB and its players foster from day one on. If that’s how he is, fine, but that doesn’t mean it should be a one size fits all thing. Baseball is starting to get that idea, but it’s not quite trickling down to the players. Letting players express themselves in-game will only help bring new eyes to the set. Hopefully, the players start to realize they have an interest in this, too, and beaning a guy for being happy about something is not the way to go anymore. Remember all the way back to 2016 when the Yankees had that disaster series against the Rays and it was the impetus for trading away Chapman, Andrew Miller, and Carlos Beltran? Regardless of that series, the Yankees should’ve done it anyway, but the path showed itself there and the Yankees are better for having done it. Similarly, the Yankees have needed and will need to trade for a starting pitcher this year. The moment that made that even more abundantly clear was on Friday night when Domingo German let the Mets hang three on him in the first inning. Undoubtedly, the Yankees have been working on deals for starters behind the scenes before, during, and after that mess of an inning, but that was just a perfect reminder of what the Yankees will need to do to win the division. Sonny Gray has–luckily–had two good starts in a row (albeit against bad teams), so hopefully he’s beginning to build momentum. Even if he is, though, the Yankees still need a starter.